As a leading logistics provider, Swiss Post offers its customers what they need, from simple parcel post with or without value-added services through to small consignment transport and complex logistics solutions within Switzerland and abroad. Swiss Post offers products and services that make receiving and managing consignments easy and convenient. And for mail order companies, Swiss Post designs online shops, processes orders, packs and sends parcels and handles returns. Swiss Post is the only provider in Switzerland with a complete portfolio of services in e-commerce. Payment, delivery, customer service – with its integrated e-commerce solution, Swiss Post ensures that the ingredients from Dr. Oetker's online shop arrive quickly and reliably in kitchens around the country. 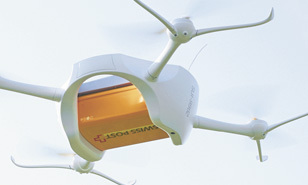 Swiss Post is testing the commercial use of drones for delivering parcels in remote areas or for urgent special consignments. Widespread use may still be a long way off for now, but Swiss Post wants to actively help shape this new technological development. Deposit your laundry bag or pick up the ingredients for your evening meal 30 minutes after ordering them online – these are services made possible by the My Post 24 terminals. Swiss Post makes its system, designed originally as parcel terminals, available to third parties whose services can be usefully combined with Swiss Post services, allowing customers to combine everyday errands with posting or collecting parcels. Example one: customers deposit their laundry bag in a My Post 24 terminal. Swiss Post picks up the laundry and three to four days later, the cleaner deposits them washed and ironed in a compartment in the terminal. This service is being tested in Gossau (canton of St. Gallen), Kriens, Winterthur Schlosstal and Basel St. Jakob. Example two: customers order their shopping online from SBB SpeedyShop. 30 minutes later, the Migros products are waiting in the My Post 24 terminal. This service is currently being tested at Zurich Central Station. In the era of online retail, customers want to receive their parcels flexibly and easily. Swiss Post is responding to these requirements – with new and convenient services. To shop online, you need a separate customer profile for each shop. It's easy to lose track. Login Post Connector offers a remedy to this problem: with a single username and password, users have access to all online shops that have integrated Login Post Connector. Master data such as name and delivery address only have to be entered once. 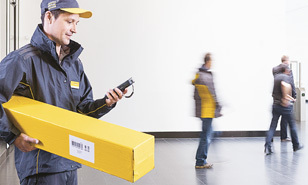 Online retailers who rely fully on Login Post Connector no longer require an address management system, because Swiss Post manages their customer data. And delivery options such as PickPost, My Post 24 or evening and Saturday delivery are integrated into Login Post Connector.